Well, two in fact. When it comes to the science of rolling your 1.68 inch ball into a 4.25 inch hole which I miss by an average of 6.5 inches, Mark Officer knows as much as anyone in this country. So much so, each year Mark is invited to speak at American Trade show on the art and science of putting and how to use the most sophisticated putting analyzer made, the “SAM” (Science And Motion) PuttLab. Marks brother Brett also a long standing member of the Australian PGA, has been a regular on our TV’s for over 20 years with his insightful TV commentary and his popular new equipment segments on The Golf Show . “Sarge” as he is better known was also a very talented player back in his day with a bunch of high finishes including a win in the Queensland Open after a play-off with Brett Ogle. These two Officers have combined their talents and teamed up to establish the most sophisticated golf teaching facility you’d ever want to see. And see it I did recently when I met Mark at the Perfectstroke Golf Training Centre at Molendinar on the Gold Coast. I’ve been around golf coaching long enough to know… that I don’t know enough. So I sat there intently and listened to Mark explain how his brother and he designed both this extraordinary swing and putting laboratory and realizing just how advanced this equipment is compared to all the other launch monitors I’d seen. It’s called the Foresight GC Quad. This puppy has four camera’s which measure all types of different information including the exact path, angle, alignment, speed etc of the club head, then transfer it to a computer screen. That’s of course after you’ve watched the result of the shot on a giant simulator screen in front of you. As well, there’s another camera which takes a video of the swing, giving the instructor every last skerrick of information required to begin fixing your problem. But wait! There’s more. If you’ve ever wondered how much an uphill/downhill/sidehill lie really affects your ball flight, distances or balance, the brothers can quickly change the lie by pushing a switch and activating four hydraulic jacks under your feet. What about a 10 or 20 kilometer wind from any given direction, I hear you say. Yep…this bad boy can do that too! With my jaw dropping to the point where Mark had to help me lift it back to its proper place just below my nose, my host then offered to take me upstairs and have a crack on the Perfectstroke Putter Lab. As I mentioned earlier, Mark is one of the most respected coaches in the world when it comes to the most frustrating part of the game and as you can imagine, his SAM PuttLab analyzer facility was equally impressive. The perfect synthetic 20 foot green runs at approx 11 on the stimp- metre but again with the instillation of hydraulic jacks under the floor, which has been pioneered by Mark and Brett, you can see first hand how much influence this can have on a putt. I don’t know about you but I’ve always suspected that I’ve never really aimed far enough away from the hole on a breaking putt which means I make a compensation by shoving my ball further up the hill during my stroke. Mark, with the help of SAM made it blatantly obvious my suspicions were spot on. I couldn’t wait to get back home and practice a simple drill Mark gave me using some string and start winning back some of those bottles of red I’d been losing to my so called mates who have been clearly taking advantage of my putting affliction! 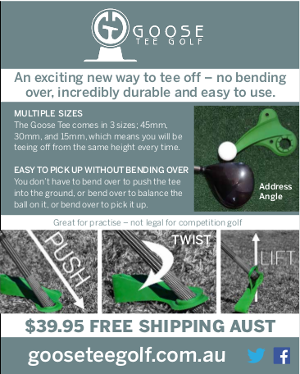 Mark and Brett’s extraordinary facility is available to any golfer, group or Coach to use and can be found at Unit 6, 23 Activity Crescent Molendinar QLD.